So, when I became a fan of Elizabeth Kerner and the Tales of Kolmar that same habit started in relation to the wonderful world of Kolmar. 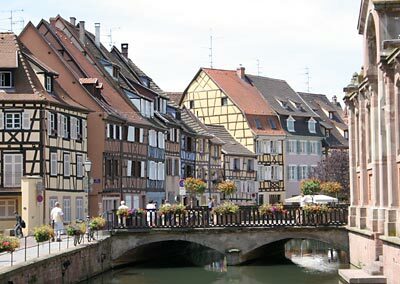 Next time I'm in the region (the Alsace is not too far) I will definitely try to visit Kolmar / Colmar! I thought I made it up. I DID make it up, I just didn't realise that somebody (sombodies) else came up with it first! I, like many fantasy authors, sometimes steal real names. There is a place called Trollingwood (which struck me as deeply bizarre in the midst of urban South Carolina), and a place called Eynhallow too. I suspect other place-names are common as well, though I thought I made up Lanen Kaelar and Maran Vena. Haven't the heart to Google them! Mostly I just like the sounds, and they fit in with the character of the place or the people. I tend to have an Anglo-Saxon bent to my constructions, though occasionally a Finnish influence comes in. I think I was frightened by the Kalevala at an early age! "Lanen Kaelar" gives over 13,000 hits! (on English pages) but... they're all yours! OK, I didn't check them all, but the vast majority, as in 99% or so, is yours. I have a problem with Lanen's mum. Everytime I read "Maran Vena" I get this leitmotif of the Spinners' version of "Ellen Vannin". To add to the tally: there are about 7500 hits for Maran Vena. The top 6 are you. It then descends to a fashion house called Vena Cava! P'ter, you should search exlusively for the combination, otherwise Google will pick up all pages with the words "maran" and "vena"; so you should search for "maran vena" (includeing the quotation marks), because only then Google will look for that exact combination. Needless to say that's what I did searching for "Laenen Kaelar". A literary pseudonym for Gertrud Käthe Chodziesner (10 December 1894 – March 1943). She was a German lyric poet and writer of distinction. She was born in Berlin and died, after her arrest and deportation as a Jew, in Auschwitz, a victim of the Nazi's Final Solution (Endlösung). Though she was a cousin of Walter Benjamin, little is known of her life. She is considered by some to be the finest female poet in the history of the German language. Kolmar Laboratories, Inc. based in Port Jervis, New York is a leading provider of outsourcing services including manufacturing, packaging, and clinical services to the North American health and beauty care and healthcare markets. We offer our customers a complete range of services, including product conceptualization, formulation, manufacturing, filling, packaging, clinical stability and micro-bacterial testing services. In addition, we provide materials procurement, warehousing and distribution of finished products. It is not a young company... Mr. Lessing L. Kole started Kolmar in October 1921 in a small store on Johnson Street in Milwaukee, WI with Dr. Frederick Marsek, who had been the Chief Chemist at Palmolive in Milwaukee. The name of "KOLMAR" was derived from their names. Kolmar is North America's largest contract formulator and manufacturer of color cosmetics, providing a complete range of makeup and skin care products. Kolmar is also a Dutch cleaning and window washing company, soecialised in cleaning from floor to ceiling (their own words). They wash windows up to a height of 8 meters. No skyscrapers for Kolmar! Their website doesn't even say where they are based but the telephione area code of 077 revelas the company is from Venlo in the Limburg province. Former garage-band guitarist and classically-trained composer, Doug Kolmar moved to Maine from the New York City Area in 2002. After landing in Portland, he was soon playing showcases with Just Plain Folks and Maine Songwriters Association, becoming a regular part of the fertile Portland acoustic music scene and performing at venues such as Acoustic Coffee, 128 Free Street, and festivals, including the Ossipee Valley Bluegrass Festival. He has released 3 CDs: 2001's The Whole Story is Long and Complicated (under the band name Dogs Gone Fishing) Homebody/Somebody in 2005, and As If I Was Almost Here in July, 2006. Can I have that wall when you're done with it, Maelin? Why do you want her Dent-mentia? Wendy Kolmar is professor of English and Women's Studies and Director of Women's Studies (I alwaus think that sounds like a school full of boys/men...) at Drew University in Madison, New Jersey. Martin Kolmar, from Switzerland, seems to be an authority on publci fiance and fiscal law. He works at the University of Sankt Gallen in Switzerland and is known on the internet by his many publications. Weneke Kolmar, lives in the Netherlands and is looking for family members through a hobby website for amateur-genealogists. In July 2006 there's a court case in Mexico between Kolmar Petrochemicals and Grupo Idesa. On March 10, 2005, an appeals court from Mexico's First Circuit, by refusing to grant a Writ of Amparo, confirmed a judgment issued on appeal in the matter of Kolmar Petrochemicals Americas Inc. (Amparo Directo Civil No. 127/2005, Primer Tribunal Colegiado del Primer Circuito). The Kolmar case touches on the often complex issues of contract formation, interpretation of party intent, and interpretation of the United Nations Convention on Contracts for the International Sale of Goods (hereinafter the "CISG" or the "Convention"). It also shows the difficulties in interpreting the CISG encountered by the several Mexican Courts that heard the case at different levels, the Trial Court, the Superior Court of Mexico City, and the Federal Circuit Court. Kolmar filed a lawsuit against Idesa with the Fiftieth Civil Court of First Instance in Mexico City claiming specific performance of the November 29, 2002 contract, damages in an amount of not less than US $724,500.00, interest and costs including attorneys' fees. In its response, Idesa raised as one of its defenses that no contract had been formed, that the e-mails were merely attempts to negotiate a contract. The Court of First Instance found this theory persuasive, and decided in favor of Idesa. Kolmar appealed to the Superior Court of Mexico City but I think we've read enough about this, right? Turns out that "De Kolmar" is a streetname in the town of Mantgum in the province of Friesland in The Netherlands! On the other side of the world Kolmar appears as an Elementary School in Oak Lawn, Illinois. Kolmar Avenue Elementary School, located in Oak Lawn, Illinois, serves grades PK-5 in the Oak Lawn-Hometown School District 123. It is among the few public schools in Illinois to receive a distinguished GreatSchools Rating of 8 out of 10. This school has an average Parent Rating of 5 out of 5 stars, based on reviews from 12 parents. But also in Crestwood, Illinois! Hmm, name after the same person maybe? Kolmar Elementary School serves Kindergarten through 8th Grade Students From The City Of Crestwood, Which Is Part Of Cook County. Some Or All Students From This School Participate In Free Or Reduced Lunch Programs. You know, I think it's just as well I never knew any of this stuff... bad enough I realised a few years ago that the producer of one of my favourite films, The Ghost and Mrs Muir, was one Fred Kohlmar! Uh.. is that a subtle way of saying: shut up Hans? No, not at all! It just makes my mind reel a bit. And I prefer roundabouts to traffic lights... Though you're right, P'ter, I'm generally as subtle as a brick, so if you are finding subtleties in my posts, you're probably making them up yourself! No Dear, I'm just making up the subtleties you would have made up if you weren't so block like. You go right ahead, P'ter. that happen and where did that come from!!! Thanks, Maelin. It's coming along, but am writing a difficult emotional bit and tend to run away. Will be good this morning. "kill anyone lately, or bring anyone back to life?" I appreciate your wanting to know, but if I told you I'd have to kill you, and I'd hate to deprive the world of your glorious talents! Unlike Ms Moon going around waving swords in all directions. Indeed. That's why I made Lanen basically a non-combatant. Elizabeth Moon knows what she's talking about, I don't. Except when it comes to disorganized mayhem, then I have a reasonable idea! Lanen...perhaps you should take up a class in swordsmanship...it might ease some of your writer tensions...LOL. Hang in there Girl...if its that hard for you to write about it...LORD, its going to magnificent for us to read about it...you do have such an incredibly lovely way with words....I'm getting so excited again!!! This new book is going to be rather different - though I'm quite excited about it as well. Keeping several fingers crossed myself! Oh I have another *Kolmar*name for you...in one of Martin's *Perry Mason* T.V. series from the 50's, one of the bad guys was named *Colmar*...just thought I would add that to Hans...list of Kolmar people and places.